8:05 pm ET - The officials have made the decision to call the race. Checkered flag. So... the No. 45 finishing position is fifth and the No. 44 7th. A very disappointing race for everyone. Because of the amount of water still on the track and the complexities of preparing the racecars to run again, it is an understandable decision. The Lizards will go into Laguna still in the lead in the championship - 19 points ahead of Risi Competizione No. 62 Ferrari. The No. 62 is the winner in GT2 in today's much shortened race. 8:03 pm ET - I've turned the radio back on, although we are still red flag. Still not much of an update. The weather appears to be lightening up and we just heard the track blower go by as they work to try and dry out the track. They want teams to be on stand by to restart. I have clarification on the "official race" status. The clock is still running, so the race has passed its 50% required running time and is an official race so points will count. If the race is restarted, the No. 45 will have a chance to improve from the P5 position. the No. 62 Risi Ferrari is currently in the lead in GT2. If they do not restart the race, we will finish in fifth. The No. 45 and the No. 62 are the two cars in contention for the GT2 championship. If the race is not restarted, the No. 45 will go into the season finale at Laguna still in the lead, but only 19 points ahead. There are 25 points possible at Laguna. In that scenario, at Laguna, the No. 45 would win the championship if they finished in tenth or better position, regardless of where the No. 62 finished. But the car would have to finish. 6:56 pm - Race control notified the teams to be ready at 7:30 pm ET and that their goal is to restart the race if the weather clears up enough to allow them to clean the track and get it dry enough to race. It is still raining heavily. 6:22 pm - An update from race control that there is a possibility that the race will restart. At this point, I'm unclear if the race is considered official or not. I'll update you as I know more. 5:33 - Still on rain hold and still raining. Race control will give us another update at 6:00 pm. We are pretty drenched at this point. 4:55 - We are still on a rain hold. The race clock is still running - it is at 4 hours and 25 minutes left to go. It's difficult to tell from the radar, but we estimate that it will be at least an hour of this rain. 4:20 - OK we are on on a red flag rain hold. The track is a skating rink and is undriveable. Cars are parked in pit lane and covered with tarps. Hopefully this weather cell will go through and things will dry out again in time to finish out the race. Positions: P1 No. 62; P2 No. 92; P3 No. 87; P4 No. 4; P5 No. 45; P6 No. 3; P7 No. 44; P8 No. 28; P9 No. 21; P 10 No. 40; P11 No. 17; P12 No. 90; P13 No. 11. 4:03 - The No. 62 is in the pits for a change of their rear decklid. They had a full lap lead on the rest of the GT2 pack, so they should still retain the GT2 lead. 3:56 - The No. 3 Corvette is off under yellow deep in gravel. Positions: P1 No. 62 (which is now 1 lap ahead); P2 No. 92; P3 No. 87; P4 No. 4; P5 No. 45; P6 No. 3; P7 No.44. No. 92, 87, 4, and 45 are all on the same lap. Still yellow. 3:49 - No. 44 pits for driver change to Darren Law, rain tires, and fuel. No. 45 pits at the same time for a windshield tear off, rain tires, and fuel. It is now pouring rain. Positions: P1 No. 62; P2 No. 92; P3 No. 87; P4 No. 4; P5 No. 45. Cars are off everywhere - the No. 1 Audi off in 10, the 88 Drayson off. Both have continued. Standing water on the track. Stil yellow. 3:47 - Patrick reports zero visibility with oil smeared on the windshield. 3:44 - Green flag. Positions: P1 No. 4; P2 No. 3; P3 No. 87; P4 No. 92; P5 No. 5; P6 No. 62; P7 No. 44. The top six GT2 cars are all on the same lap. It is raining, but still fairly lightly. 3:38 - The No. 45 pitted for fuel and to clean the windshield. Still yellow. The No. 92 and No. 62 pitted shortly after that and both of them are on rain tires. the No. 45 is still on slicks. 3:30 - The No. 2 Audi which is in the overall lead spun in Turn 5 under yellow - he is able to continue. 3:19 - The No. 45 pits for driver change to Patrick Long, tires and short fuel. We will stay on slicks. The rain has not yet materialized. The No. 62 is in the pits, as is at least one of the Corvettes. This will be a lengthy caution. The No. 62 beat us out of the pits for position. The No. 92 did not pit, and I don't think either Corvette pitted but am not sure about that. Positions: P1 No. 92; P2 No. 4; P3 No. 3; P4 No. 87; P5 No. 62; P6 No. 45. Still yellow. 3:17 - Big crash with the No. 12 prototype in the tires in Turn 1. No report on the driver. Yellow flag. No. 12 driver is shown on TV and appears OK.
3:13 - Marc has heavy pressure from the No. 92 BMW in P2, with both Corvettes (in P3 and P4 and both on new tires) closing rapidly. The No. 45 did not take tires on the last stop because they had expected they would have to stop shortly for rain tires. 3:10 - In the No. 45, Marc Lieb is in the lead. The No. 92 BMW is close behind him and the No. 4 Corvette is a few seconds back from them but closing the gap. 3:05 - Positions: P1 No. 45; P2 No. 92; P3 No. 4; P4 No. 3; P5 No. 87; P6 No. 62; P7 No. 44. Still yellow. Both No. 87 and No. 62 are back on the same lap with the GT2 leaders. 3:02 - Still yellow. P1 No. 45; P2 No. 92; P3 No. 4; P4 No. 3; P5 No. 62; P6 No. 87. Heavy rain expected shortly - when the track is sufficiently wet, we expect that we will pit for rain tires. No. 44 pits for fuel. Johannes van Overbeek will stay in the car. No. 62 in the pits - they just made it out in time to get their lap back - so they are now on the same lap as the No. 45, 92, 4, 3, and 87. 2:59 - The No. 4 Corvette pitted, and the No. 3 Corvette pitted again for a second time. 2:57 - Positions: P1 No. 4; P2 No. 3; P3 No. 45; P4 No. 92; P5 No. 62; P6 No. 87. No. 44 is P7. 2:53 - Big crash with a loose tire in the middle of the track. Yellow flag. No. 11 Viper. No report on driver. Heavy impact direclty into the concrete wall, from the rear. The driver appears to be out of the car and walking. The No. 45 will pit under this yellow for fuel. Marc Lieb will stay in the car. No tires. They will stay on slicks for now. We expect heavy rain in the next 10 to 15 minutes. he is out again quickly. The No. 3 and No. 92 also pitted, I'm not sure about the 62 or 87. The No. 4 Corvette did not pit. 2:45 - Rain is 10 miles out and looks like it will hit us. Marc Lieb is P2. he is close behind the No. 3 Corvette, which is in the lead. The No. 4 Corvette, which is P3, has closed the gap and is catching up. Marc is now in a Corvette sandwich. The No. 3 Corvette has now caught up to the No. 87 Farnbacher Loles Porsche and the No. 62 Risi Ferrari - those cars are one lap down but are physically in front on track. 2:31 - The GT2 field is once again stacked nose to tail. The No. 21 Panoz, which is several laps down, is at the front of the train, with the No. 62 Risi Ferrari (1 lap down on the leader), followed by the No. 87 Farnbacher Porsche,, also one lap down, followed by the No. 3 Corvette (the GT2 leader), followed by Marc Lieb in the No. 45 (in P2). 2:26 - Big spin for the No. 92 BMW who was in P3. Marc Lieb moves to P3. Correction - Marc now P2. Positions: P1 No. 3; P2 No. 45; P3 No. 4; P4 No. 92; P5 No. 62; P6 No 87. 2:20 - At the 3 hour mark, the No. 45 is P4, the No. 44 is P8. Still yellow. The No. 44 is pitting for another splash of fuel. Some weather cells are developing Southwest of us - so far, we've been lucky and have had only light rain but I expect we'll see some heavier rain in the next few hours. 2:14 pm - Green flag. Marc Lieb is in the No. 45, Johannes van Overbeek in the No. 44. And once again, double yellow as the No. 20 car flies into the gravel at Turn 10. 2:11 pm - The order out of the pits was the No. 62 Risi Ferrari, followed by the No. 87, the No. 3 and the No. 4, then the No. 45. However, I believe that we gained a full lap on the No. 62 and No. 87. Positions: P1 No. 3; P2 No.4; P3 No. 92; P4 No. 45; P5 No. 62; P6 No. 87. Physically on the track, the No. 62 and the No. 87 are just ahead of the Corvettes, however they are one lap down. 2:09 pm - The No. 3, 4, 92, 62, 87 and 45 are all pitting at the same time. the NO. 44 will also pit shortly for driver chnage. 2:08 - The No. 88 is back underway but and slowly returning to the pits minus a wheel. 2:05 - The Drayson No. 88 prototype is in the wall after apparently losing a wheel. A very hard hit. Yellow flag. No report on the driver yet. The NO. 45 will pit under this yellow for tires, fuel and driver change to Marc Lieb. 1:50 - The No. 62 has overtaken the No. 87 for P5. The No. 87 is P6. Darren is now P8 in the No. 44. The Corvettes now have a hefty gap to the rest of the GT2 field - 16 seconds to Joerg. Positions: P1 No. 3; P2 No. 4; P3 No. 92; P4 No. 45; P5 No. 62; P 6 No. 87. 1:34 - Joerg is by the Viper, but the No. 92 BMW also got by Joerg. The No. 87 and No. 62 are close behind. Positions: P1 No. 3; P2 No. 4; P3 No. 92; P4 No. 45; P5 No. 87; P6 No. 62. The No. 44 is physically on track between the No. 45 and the No. 87, but he is several laps down. 1:30 - Positions: P1 No. 3; P2 No. 4; P3 No. 45; P4 No. 87; P5 No. 92; P6 No. 62. The Corvettes are being held up by the Viper and the No. 44. The Vettest are both by the No. 44, and now the No. 45 is also by. Positions remain unchanged. There's a bit of a gap now to the next closest GT2 car which is now the No. 92 BMW in P4. The No. 87 is P5 and the No. 62 is P6. Joerg is unfortunately now stuck behind the Viper, which is not on the same lap, and he's lost his gap. 1:26 pm - Green flag. We are two hours into the race. Joerg is P3 in the No. 45. Darren is P9 in the No. 44. The Falken Porsche, which is not on the GT2 lead lap, is between Joerg and the NO. 87 and the No. 62, which is giving Joerg a bit of space. 1:19 pm - The No. 62 Risi Ferrari, which was in P4, is in the pits. This will put the No. 87 into P4 and the No. 62 into P5. 1:16 pm - Still yellow. It is starting to drizzle again. 1:11 am ET - Joerg and the two Corvettes are now nose to tail. Joerg is on a faster pace and has caught the No. 3, which is P2. The No. 4 is P1. The No. 66 de Ferran prototype is in the wall at Turn 5- it should go yellow. This will not be good for the Lizards - it will allow the No. 62, which is now P4, to close the gap to the No. 45. the No. 87 is now P5. The No. 66 was able to continue but has front end damage and will return to the pits - it's been a tough race so far for that team. 1:05 pm - Green flag. Joerg is P3; Darren is P9. Heavy prototype traffic is threading through the lead GT2 pack. 1:00 pm ET - The No. 44 is in the pits. Positions: P1 No. 4; P2 No. 3; P3 No. 45; P4 No. 87; P5 No. 62; P6 No. 92; P7 No. 11; P8 No. 40; P9 No. 44. 12:56 - I believe the GT2 lead positions remain unchanged after they all pitted and returned to the track. Still yellow. No - correction - the No. 62 and No. 87 swapped positions - the NO. 87 is now P4 and the No. 62 now P5. Both cars changed drivers. The No. 92 BMW is now P6. Darren is pitting in the No. 44 - the crew will again change the left rear tire, which was damaged in the earlier incident with the Falken Porsche, and will do a careful inspection to see if they can figure out what is causing the handling problem with the No. 44. 12:53 - The No. 45 pits for a setup change, tires and short fuel. Joerg will stay in the car. Still yellow. He was in P3 at the time of the pit stop. The No. 4 (in P1) and No. 3 (in P2) Corvettes also both pitted, as did the No. 62 Risi Ferrari and the No. 87 Farnbacher Porsche. 12:52 - yellow flag to remove the debris. I expect both of the Lizard Porsches will put under this yellow. This will be both good and bad for the Lizards. It should allow the No. 45 to close the gap to the Corvettes, but it will aslso let the No. 62 Risi Ferrari catch back up to Joerg. 12:48 - The No. 45, in P3, is plus 26 seconds to the Ferrari, which is P4. Joerg is running a slightly faster pace than the Ferrari right now. Positions: P1 No. 4; P2 No. 3; P3 No. 45; P4 No. 62; P4 No. 87; P6 No. 92. Bodywork on the back straight - yellow flag. Looks like it is the decklid from the No. 40 Ford. 12:42 - The No. 90 BMW pitted with a mechanical problem, putting the No. 62 into P4 and the No. 87 P5. There is a 25 second gap between Joerg in the No. 45 and the No. 62. The BMW is going behind the wall. Jeorg reports that the car is not handling well - more and more oversteer. The engineers will make a change at the next pit stop, but Joerg will have to work with it until then. 12:39 - Darren did a bounce through the gravel in the No. 44 but was able to continue. He reports that the car is "a bit weird" when turning left. 12:35 - Lots of drama on track as cars are slip sliding everywhere. Positions: P1 No. 45; P2 No. 90; P3 No. 45; P4 No. 90; P4 No. 62. In the No. 44, Darren is P11. Penalty assessed to the No. 37 prototype for avoidable contact with the No. 66. 12:30 - The No. 44 has another problem - there is smoke from the left wheel. Darren is pitting again - they crew believes it may be bodywork rubbing. Darren is in P11 right now. 12:27 - No. 44 was involved with an incident with the Falken Porsche - the No. 17 appears to have run into Darren. Both cars are in pit lane for the crew to check damage. the No. 44 left rear wheel is broken and is being replaced. Darren is back out again. Penalty assessed to the No. 17 for avoidable contact with the No. 44 - a stop and go penalty under green. Darren reports smoke on left rear. 12:24 - Power is out in the pits, unfortunately. Joerg, in P3, has a 10 second gap now to Bill Auberlen in the No. 90 BMW, which is in P4, and 16 seconds to the No. 62 Risi Ferrari which is P5. 12:20 - The first round of GT2 pit stops are now complete. I believe all GT2 cars are now on slicks. Positions: P1 No. 4; P2 No. 3; P3 No. 45; P4 No. 90; P5 No. 87; P6 No. 62. Some of the GT2 cars did driver changes (the Lizards did) but not all. 1 hour complete, 44 laps by the leader. The race will go to 1000 miles or 10 hours, whichever comes first. 12:17 - No. 45 is P3. The No. 90 BMW is just behind Joerg. 12:15 - The No. 44 is coming in now for slicks and driver change to DArren Law. Positions: P1 No. 4; P2 No. 90; P3 No. 17; P4 No. 17; P5 No. 45; P6 No. 40. No. 44 is P11. 12:11 am - the No. 3 Corvette came in for slicks. They were in the lead. The No. 45 is in for driver change to Joerg Bergmeister and a setup change and change to slicks. The No. 44 is also in the pits for slicks and driver change to Darren Law. The No. 3 had an incident heading out of the pits but was able to continue. The No. 6 Porsche spyder is spinning on track and in the grass. He as able to avoid impact with the wall, but appears to e having difficulty getting back onto the track. The No. 44 pit stop was aborted, so Seth Neiman is still out, but the No. 45 came in. Still green. The No. 62 Risi Ferari also pitted and made a decklid change. 12:08 - Patrick radios in that he may have a tire puncture and may pit. Joerg is hustling to get ready. Patrick is now P3 (as the No. 4 Corvette lost a few positions when it pitted for slicks.) All GT2 cars are on rains except the No. 4. 12:05- The No. 4 Corvette, which was in P2, is in the pits. Looks like he is moving to slicks - the first GT2 car to do so. The No. 62 has caught Patrick and is now right behind him. Both Lizard Porsches (and most of the field) are still on rain tires. 12:02 - In the No. 87, Wolf is now by Patrick, putting Patrick in P4. The No. 62 Risi Ferrari is in P5 - 3 seconds back. Positions: P1 No. 3; P2 No. 4; P3 No. 87; P4 No. 45; P5 No. 62. the Corvettes continue to pull away from the rest of the GT2 field. 11:57 am ET - Patrick and Wolf Henzler (in the No. 87 in fourth) are nose to tail. 11:51 - the No. 87 is right behind Patrick. Prototypes are continually threading between them, giving Patrick a bit of a gap, but the 87 is running at the same pace. Patrick is 16 seconds back from the GT2 leader, the No. 3 Corvette. The issue now is that the cars are on rain tires and as the track dries out, it will become more and more difficult to run on those tires. Patrick is looking for ways to cool the tires down but finding areas of water on the track. At some point, the engineers will need to make the decision to move to slicks. You can see on the TV all of the cars going off line to find areas of water to cool the tires down. 11:46 am - The No. 3 Corvette is in the lead, and has built a 15 second gap to Patrick, who is in P3. The No. 4 Corvette is P2. The No. 87 Farnbacher Loles Porsche is P4 and the No. 62 Risi Ferrari is P5. The No. 87 is close behind Patrick and he and the No. 62 are now on Patrick's pace. 11:38 - The No. 20 Dyson prototype, which started on the P2 pole, is in the pits for an unscheduled pit stop. The No. 28 LG Corvette is also in the pits for an early stop, as is the Oreca Matmut prototype. 11:35 - Positions: P1 No. 3; P2 No. 4; P3 No. 45; P4 No. 87;P5 No. 62; P6 No. 92; P7 No. 40; P8 No. 90; P9 No. 21; P10 No. 17; P11 No.11 P12 No. 28; P13 No. 44. Patrick is keeping pace with the two Corvettes and they are doing mid 1:32s. 11:30 - The No. 3 Corvette has built a nice gap to the rest of the GT2 pack. The No. 4 Corvette is 4 seconds behind the No. 3 and Patrick in the No. 45 is five seconds behind the No. 4. 11:26 - Patrick is by the No. 40 and is now P3. Positions: p1 No. 3; P2 No. 4; P3 No. 45; P4 No. 87; P5 No. 62. The GT2 cars are bunched up and all nose to tail. 11:25 am - The No. 4 Corvette is now by Patrick as both cars are stuck behind the No. 40. Patrick Now P4. The NO. 40 Ford has a lot of power and it is very difficult to pass him. 11:23 - The No. 4 Corvette went off and Patrick moved up to P3. Positions: P1 No. 40 ;P2 No. 3; P3 No. 45; P 4 No. 4; P 5 No. 92. The No. 3 Corvette just passed the No. 40 to take the lead. Patrick is just behind the NO. 40 trying to get by, with the No. 4 Corvette right on his tail. 11:22 am ET - The No. 45 is P5. Positions: P1 No. 40; P2 No. 4; P3 No. 92; P4 No. 3; P5 No. 45; P6 No. 90. 11:21 am ET - Clean start so far for the field. The cars in pit lane have been released and have entered the track. Very wet track and poor visibility. 11:20 am ET - Green flag. 11:15 am ET - Cars are rolling for 2 pace laps. The No. 45 is fifth on the grid and the No. 44 tenth. 11:13 am ET - Engine start. 11:05 am ET - Just a few minutes away from race start. We qualified sixth (in the No. 45) and 13th (in the No. 44) but because several cars will start from pit lane the No. 45 will move up at least one position, and the No. 44 probably several. I don't have an actual starting grid list, but the first five will be: P1 No. 40; P2 No. 4; P3 No. 91; P4 No. 90; P5 No. 45. The No. 28 Corvette qualified second, but did not make it out before pit lane closed before the recon laps so they will start from pitlane. 10:52 am - The cars are on the grid. Quite a few cars did not make it out before pit exit closed, so they will start from pit lane. For GT2, I see the Falken Porsche and the 28 Corvette lined up. The Highcroft Patron prototype also is in pit lane - a new chassis, completely repaired for the race after the huge accident during practice on Thursday. 10:10 am - Checkered flag on the very wet morning practice. The cars will head out for their recon lap in fifteen minutes, then to the grid. This will definitely be a rain race. Hopefully the heavy rain will hold off at least for the start. The track could dry out quickly if the rain lets up. Yes, we just heard from race control that this is declared a wet race. This means that teams may run different tires (rain tires) than they qualified on. We'll be back with you in about 45 minutes. We'll broadcast our team radio during the race. See you shortly. 10:00 - Driver change in the No. 45 to Joerg Bergmeister. the No. 87 took an off course excursion but Wolf Henzler bounced right over the gravel trap, mowed some grass, and then and was able to continue back to the pits. 9:57 - Darren is safely back in the pits in the No. 44. I think they are done for the session. It's still raining steadily and the conditions are very slick. The temperature is dropping and it's at least 10 degrees cooler than it was at 6 am this morning. We have some schedule changes today - recon laps will be 10:15 to 10:20. The race is still scheduled to start at 11:20 am ET. Heavy rain is forecast for later today, so I expect at least some of the race will be run under yellow, or possibly red flagged due to rain. If that happens, the cars will wait in pit lane (on the fast lane side) until the conditions are safe to continue. Crews will not be allowed to work on the cars in pit lane. 9:55 - Darren Law is out in the No. 44 and Patrick Long is in the No. 45. 9:50 am ET - Warmup is underway. It's lightly raining and still very wet but both Porsches will go out for at least one install/warmup lap to ensure we don't have any issues. We are broadcasting our team radio this morning and during the race. Click on the "Follow the Race Tab" on the home page to listen. 9:00 am - OK, here's the update. Warmup will run from 9:45 to 10:10. The No. 45 will go out, the No. 44 will probably go out. The race will start as scheduled at 11:20. Several periods of very heavy rain are forecast during the race. The race will be official at the halfway point - 197 laps or 5 hours, whichever comes first. 8:05 am ET - Good Morning from Road Atlanta. After 2 hours of torrential rain, we are pretty darned wet. Warmup is scheduled for 8:15 this mrning but it's on hold for the moment. The track is a river. But the rain has let up and hopefully the track will dry out in time for race start. There are several heavy weather cells on the way though so it is going to be a wet one either way! I'll update you as I know more, but for now, most likely no morning warmup. 2:35 pm -Patrick Long qualifies the No. 45 sixth in GT2 and Seth Neiman is 13th. David Murry put the No. 40 Robertson Racing Ford on the pole. 2:33 pm - Chief strategist Thomas Blam called Patrick in - he is P 4. They will refuel and may send him out again. They will sit tight and see if anything changes in the conditions that might give us an advantage. 2:31 pm - The No. 28 Corvette is P1 with a 1:21.024. the No. 40 Ford is P2 with a 1:21.592. The No. 45 is P3 with a 1:21.531. 2:29 pm ET -Patrick has moved to P1. The No. 62 Risi Ferrari has a puncture on its second lap and is limping along the track. That will be the end of their qualifying session because they cannot change tires. 2:25 pm ET - Good afternoon from Road Atlanta. Green flag on today's qualifying session. Patrick Long will qualify in the No. 45 and Seth Neiman in the No. 44. It's hot, hot, hot here and very humid. Skies are starting to cloud up but it looks like it will stay dry for qualifying. Rain is forecast for raceday. Reminder that SpeedTV is broadcasting today's qualifying session live and SpeedTV.com is also. 10:00 - Checkered on our practice session for today. Qualifying starts at 2:25 pm ET today, and the race starts at 11:20 am on Saturday. See you then! 9:55 - Green flag. Patrick heads out in the No. 45 and Seth Neiman is back in the No. 44. 5 minutes left in the session. 9:51 - Red flag. The No. 90 BMW is deep in the gravel. Patrick just completed a stop and go penalty for a pit lane speeding violation. This may be the end of the session. Reminder that qualifying is today at 2:25 ET - it will be broadcast live on SpeedTV.com. 9:38 am - Green flag. Just over 20 minutes left in the practice session. 9:30 - Red flag to pull the Falken Porsche out of the gravel. Johannes van Overbeek is now in the No. 44. Patrick is still in the No. 45. 9:21 - They are still working on some setup adjustments on the No. 45 - with a bar change. Driver change from Marc to Patrick Long. Neiman is still out in the No. 44. Just over 30 minutes left in practice. 9:11 - Chief strategist Thomas Blam calls Marc into the pits for a damper change. Neiman is still out on track in the No. 44. Marc is currently P4 in the seession. The No. 3 Corvette is P1. 9:05 am - Marc Lieb is currently P1 in the No. 45 with a 1:21.529. Reminder that the race will be broadcast live on SpeedTV starting at 11 am ET tomorrow (Saturday). SpeedTV.com will broadcast today's qualifying session online - starting at 2:25 for GT. 9:00 am ET - Good morning from Road Atlanta. Green flag on today's practice session. The No. 44 and No. 45 are both heading out. Seth Neiman is in the No. 44 and Marc Lieb is in the No. 45. So far, the weather is holding - rain is expected later today and unfortunately, throughout the day tomorrow. We've had less practice time than expected this week due to a large number of red flags. But otherwise, things are going well for the Lizards. We are in the lead in the GT2 championship - Joerg and Patrck are 31 points ahead of Melo and Kaffer in the No. 62 Risi Ferrari, and the team is 31 points ahead of Risi in the team championship. If Joerg and Patrick finish within one position of Risi on Saturday - whether ahead or behind - they will win the championship. There are 30 points at stake here (for first) and 25 points at Laguna. 9:10 pm - The No. 45 is back out for another lap to test the headlight repair. Joerg is in the car. He is back again in the pits after 1 lap - the crew will take the car back to the garage to complete the work and our setdown. We'll be back with you tomorrow for our morning practice at 9 am ET, then qualifying at 2:25. See you then! 9:00 -Red flag for the safety officials to pick up some debris on track. The No. 44 is back in the garage. The No. 45 is still in the pits - Joerg will take the car back out one more time to test a minor repair. 8:52 pm ET - And Darren is in the pits in the No. 44, they are done for the night and are heading back to the garage. It looks like the No. 45 may go out one more time to confirm a repair to the headlights. We'll be back with you for our final practice session tomorrow morning at 9:00, then qualifying at 2:25 pm ET. See you then! 8:40 - Joerg is in the pits. The No. 45 is done for the night - all three drivers have completed their required night laps and the car will head back to the garage. Darren Law is still out in the No. 44 but he should be back in shortly. 8:31 - In the No. 45, Marc is out of the car now and Joerg is in for his stint. In the No. 44, Darren is back in the pits. He will go back out for a few more laps for them to complete bedding the new rotors. The session lasts until 9:05 but I expect we will finish up in 15 minutes or so with both cars. 8:27 - Darren is now out for this 3 laps. In the No. 45, Marc is now P8. He will pit this lap. 8:19 pm - Marc Lieb is now behind the wheel of the No. 45. The No. 44 crew is making a few repairs to the car - Darren's still in the pits. 8:13 pm ET - Patrick Long is now on track in the No. 45. It has cooled down substantially - Patrick just radioed in that it's taking a long time for the tires to come in. In the No. 44, Johannes has done his three laps and now Darren Law is in the car and heading out for his stint. 8:00 pm ET - The final practice session of the day is underway. It's fully dark now. The NO. 44 is in pit lane after having done an install lap. Seth Neiman will finish out his three required laps and then hand the wheel over to Johannes van Overbeek. The No. 45 crew is just finishing up work on the car in the garage and that car will be in pit lane shortly. Both cars have their race engines in and the enigneers are using this session to ensure that there are no issues. 4:00 - Checkered flag. The session has ended. The track will continue the repairs on the fence after the accident. Thankfully, it appears that no one was injured in the major accident - we see the driver Scott Sharp on TV as he heads back to the paddock and he appears to be OK. We'll be back with you for evening practice at 7:20. See you then! 3:43 - Major accident on course with the Highcroft Patron prototype. Luckily the driver (appears to be Scott Sharp) is walking away from an incredible wreck. The Highcroft car is destroyed. Medical personnel are helping the driver into the medical car - he is walking and talking with them. The No. 87 Farnbacher Loles Porsche was involved in the wreck. That driver also appears OK. It will be a lengthy yellow as both cars are removed from the course and the course officials make some fence repairs. 3:40 - In the No. 45, Joerg went out to test the setup change, then back into the pits to give Engineer Stefan Pfeiffer feedback and another change. Stefan decides to make a swaybar change and send Joerg out. The challenge that the engineers face here at this track is to balance downforce and speed with getting the maximum tire wear they can. Because of the length of the race, and many pit stops may need to be done under green, they need to be able to run tires at 150 percent of a stint or more if needed. 3:31 - Joerg now P3. The BMWs are P1 and P2 with a 1:21.686 and a 1:21.710. Joerg is pitting for a setup change. 3:27 - Joerg is P1 in the session after 4 laps with a 1:21.956. 3:20 pm ET - Green flag on this afternoon's practice session. Seth Neiman is out in the No. 44 Porsche and Joerg is in the No. 45. It's hot, hot, hot here - hot and humid. Luckily there is some high cloudcover which is helping a bit. This is our second of three practie sessions today - we have one hour now, and 1 hour and 45 minutes tonight. 11:06 - Darren took a spin on course and contacted a prototype, I think the No. 2. He was able to continue and pitted for damage. There's some damage to the rear of the No. 44 but it appears superficial. That's it for the Lizards this morning. We'll be back with you for the second practice session of the day at 3:20 pm ET. See you then! No. 92 is P1 with a 1:21.035. Darren Law is now in the No. 44 for his first stint of the day. 10:51 - 15 minutes left in the session. The No. 45 is doing a tire test, so Joerg will finish out the session on this set of tires. Seth Neiman is still in the No. 44. All good so far. 10:42 - Joerg Bergmeister is now in the No. 45. Seth Neiman is still in the No. 44 and is in pit lane giving feedback to Chief Engineer Craig Watkins. Our practice yesterday was shortened by a red flag after a prototype lost a motor on track and spewed oil all over the track, so the engineers are hustling today to get their basic setup work done. 10:26 am - Looks like it was one of the Peugeots - it has been towed back to the garage on a flatbed. Green flag. It's cooler today but still extremely humid with overast skies. We are expecting some rain this afternoon and on race day. There are three practice sessions today - this morning, then 3:20-4:20, then night practice 7:20-9:05. Each driver must do 3 laps during night practice - even if it is raining. 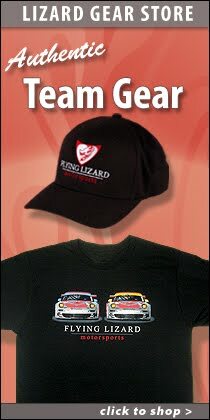 the Lizard driver lineup for this weekend is: No. 45 -Joerg Bergmeister, Patrick Long, and Marc Lieb. No. 44 is Seth Neiman, Darren Law and Johannes van Overbeek. The GT2 championship could be decided at this race, although we have one more race coming up - the season finale at Laguna Seca. Joerg and Patrick are 31 points ahead of Risi's Melo and Kaffer in the No. 62. There are 30 points at stake here, and 25 at Laguna. If the No. 45 finishes the race, and finishes within one position of the No. 62, either in front of behind, they will win the championship. 10:20 - Apparently a fire in one of the prototypes on course. I don't have any more details, although the fire is now out. This may be a lengthy yellow. 10:15 - Two cars are off in Turn, neither Lizards involved. 10:06 am ET - Good morning from Road Atlanta. Green flag on the first of three practice sessions today. Seth Neiman is in the No. 44 and Marc Lieb in the No. 45. Both cars are heading out on track now. 3:50 - Well, unfortunately the session is over after that last red flag. We'll be back with you tomorrow with three practice sessions, starting at 10:05 am ET. See you then! 3:33 - Red flag to do a track cleanup for oil and dirt on the track. 3:30 - Green flag. Patrick is in the No. 45 and is now P3. 3:16 pm - All is well so far. Patrick is in the No. 45 and Johannes is now in the No. 44. Red flag for a car is stopped in Turn 4. 2:57 - Green flag. Just over 1 hour left in the session. 2:45 pm ET - This is our first on track session of race week and the engineers are just starting their setup work getting feedback from the drivers. 15 minutes into the sesssion, Joerg is P3 and Darren is P 5. Red flag to remove debris in Turn 4 and Turn 10. 2:30 pm ET - Good afternoon from Road Atlanta. It's hot and humid here today but thankfully, dry, after the torrential rain of the last few days. Both cars are in pit lane ready to head out for today's only practice session. Darren Law is in the No. 44 and Joerg Bergmeister is in the No. 45. We have a one hour combined session with the prototypes, then 30 minutes GT only.